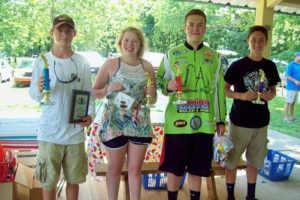 Kid & Co., a family outdoor and youth fishing event hosted by the Indiana Bass’n Gals, celebrated its 30th anniversary in August. 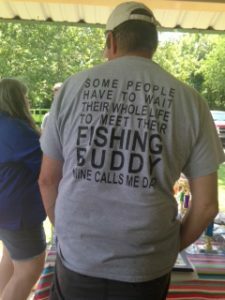 Held at Cutright Ramp on Lake Monroe, the event drew about one hundred kids plus their accompanying adults, bringing together more than 250 persons to celebrate fishing and nature. 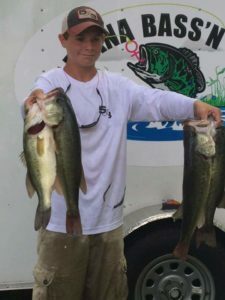 For some young anglers, this was their first year to fish Kid & Co. For others, participating in the event is a base upon which tradition and generations of family memories are built. 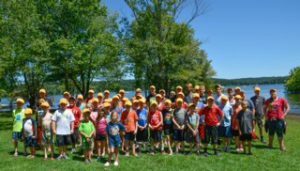 For 20 years, Danny Robinson Sr. and his wife Pam, of Shelbyville, have sojourned to Kid & Co. Each year the Robinson’s, their grown children, grandchildren — and now the next generation of great grandchildren — camp, fish, and enjoy the outdoors while honing their fishing skills. The finale of the family’s vacation is taking part in Kid & Co., as either a young angler or proud family member. 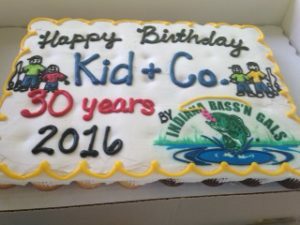 Each of the Robinson’s 12 grandchildren and at least two great grandchildren has fished the tournament. 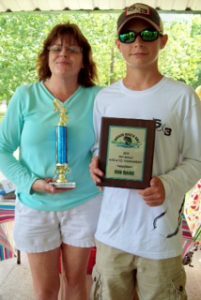 Pam said the clan has won awards twice in the panfish division and eight times in one of the bass divisions. 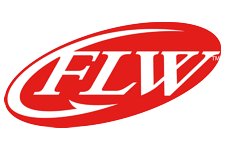 Danny is a former Indiana Bass Federation member who is now fishing the FLW. This year Lily Kirby, granddaughter, placed fifth in Teen Bass. “Danny and I have taught our children to love the great outdoors through camping, fishing, vacations and 4-H activities” Pam said. She said Danny taught their children how to fish then fishing is taught to the next generation. 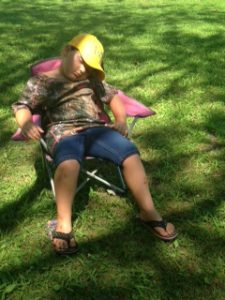 “Kids need something to love, and fishing is addictive,” she added. 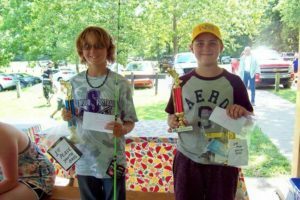 Youth ages 6 – 12 may choose to enter either the panfish or youth bass division. Anglers 13 – 17 must fish for bass. In addition to fishing, Kid & Co. has grown to include educational programming. Silly Safari, a cornucopia of exotic and common animals with ad lib humor, captivated the attention of all age groups. 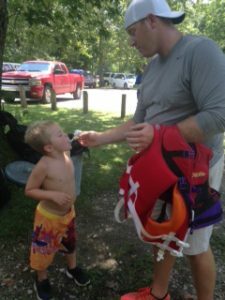 The Army Corps of Engineers, Monroe Dam, presented a forum in choosing user friendly life vests with the safe designs. 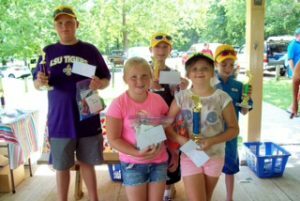 All of the kids received a door prize, participation ribbon, hat, goody bag, and the chance to have their name drawn to participate in the Dash for Cash. Both kids and adults enjoyed breakfast and lunch. “We want all of the kids to feel like winners, so we reward all of them for their effort,” said Kate Hosimer, Tournament Director. The top five youth to place in each division received a trophy and payout, which is awarded at the end of the contest. The payout was 100 percent of the entry fee which is determined by the number of contestants. The IBG derives no profit from Kid & Co. and works to secure sponsors and raise funds year round. 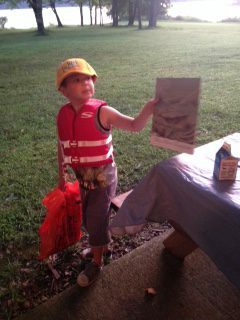 The 2017 Kid & Co. is tentatively scheduled for Saturday, August 5, at Cutright Ramp on Lake Monroe. Preregistration begins on January 2, 2017. For additional information or to ask a question, visit the IBG’s Facebook page or see their website at: www.indianabassngals.org. 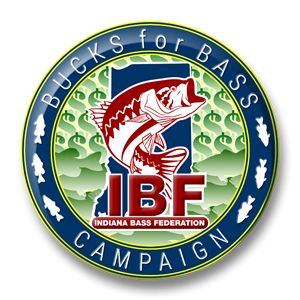 * Effinger and Fisher participate in the IBF youth bass program.